My fiancé and I were looking into having a tropical island wedding, but we were disappointed by the lack of options. It seems like it didn’t matter which island we looked at. All of their wedding packages were basically the same. The bigger drawback to not being able to customize the plan was the expense of having guests. It seems like most of these resorts expect the wedding to basically be elopements. One of my fiancé’s co-workers had just returned from a vacation in Key West, Florida, and when she told my fiancé about it, it got her to thinking. We did a little research, got in touch with a wedding planner and told her what we were thinking. She presented several different options that were all within our budget. Soon we made plans to fly down, meet with her in person and see what we could do. She took us around to several different Key West restaurants so we could choose our reception menu. We visited a dozen unique locations where we could have the ceremony. She pointed out all of the different hotel options for our guests, as well as different travel options, and helped us design a wedding that worked for us. We both fell in love with Key West so quickly that we decided to not only have a destination wedding, we were also going to make it our honeymoon as well. I don’t think we’ll be able to do everything we want to in a week, but we’re going to try. And if not, it gives us a reason to come back. My kid sister got married last year. Her and her husband wanted to have a tropical island wedding and they wanted as many people to come as possible. That means they needed to find ways to save money and make it affordable, so they settled on Key West during the summer. I love Key West and I knew that it was a great spot, but I wasn’t so sure about the summer. Still, it’s my kid sister and I wasn’t going to disappoint her. It ended up being a spectacular vacation all the way around. The wedding itself was everything she hoped for: beautiful ceremony on the beach and a reception on a gorgeous outdoor dining deck with fantastic fresh seafood and a super fun DJ. What was more surprising was how cool the rest of the trip was, and I mean that in every way possible. It wasn’t as hot or as humid as I thought it would be, there were so many things to do when we weren’t involved in the wedding, and I got a chance to hang out with some of the locals. They took me to some of the great off-the-beaten-path Key West restaurants and bars and even hooked me and my boys up with a fishing charter. We had such a great time that a few of us have plans to go back this summer as well. If it’s going to be just as hot in South Boston as it is in the southernmost city, you better believe I’m coming back. My fiancé and I wanted to do something different for our wedding. We both grew up in the same part of the state and over the years had attended far too many weddings at the reception hall not so affectionately known as “the wedding factory.” We had both been to Key West before and we knew that having a tropical island wedding would be just the special sort of event we were looking for. We started looking into it and realized it would be a lot easier than we thought. Apparently we aren’t the only people who thought Key West would make a good destination wedding spot. 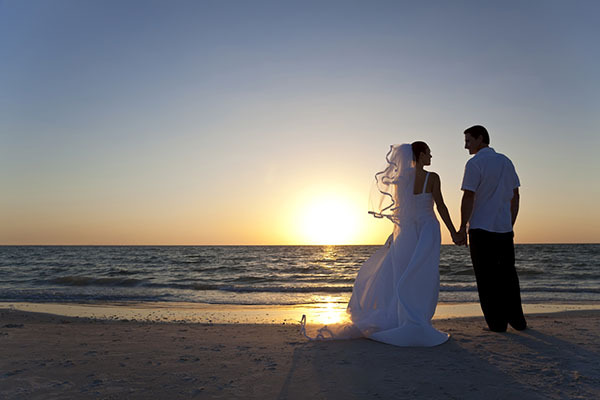 It is voted year after year as the number one choice for couples looking for a tropical wedding. It’s an obvious choice, not just because of how beautiful it is, but also because of how easy it is to get to, all the different choices for the ceremony and reception and the fact that you don’t need passports. In fact, with so many people getting married there each year, we were a little daunted that we wouldn’t have the experience we wanted. Turns out we had nothing to worry about. We interviewed a few different wedding planners and once we made our decision, we told her exactly what we were looking for. She came back with a list of options that all fit within our budget and we put together not just a scenic ceremony and a fun reception, but also several activities for our guests to do as well. We are both so excited to head back down to Key West this summer to make our dreams come true. Pretty much from the first date, my husband and I knew how to compromise on almost everything so we would both enjoy what we were doing. Still, I was a little nervous when we started talking wedding plans. I always envisioned a traditional ceremony and reception, while he wanted a tropical island wedding. I wasn’t sure how it was going to work out until we discovered Key West. We went down on an early scouting trip even before we knew much about it, and almost right away, many of my fears were put at ease. There were several churches to choose from, and many Key West restaurants had the menu, style and décor that I was looking for, but then a strange thing started to happen to me. The more I thought about our time down there, the more I realized I didn’t want to have the same wedding I could back home. We started looking at some of the different options, including getting married on a boat at sunset, or at a historic fort on the beach, and I realized how much fun and how memorable that could be. My husband was so excited about my change of mind that he blindsided me and found the perfect reception spot that was everything I could have hoped for. There were beautiful outdoor dining decks, some of the best seafood I ever had, and a casual elegance to the whole evening that was fancy enough to make the event special but relaxed enough so everyone had a great time. And when the reception was over, we didn’t even have to pack for the honeymoon. My son is getting married later this year, and in a move that flipped a lot of wedding traditions on its ear, he was the insistent one on where and how it would happen. He has always had a love for tropical paradises ever since I first read him “Treasure Island,” and when he proposed to his fiancé, he did it with the caveat they would get married on a beach with a palm tree blowing in the background. She said yes with a caveat of her own: it better not include any more work than planning a wedding at home would be. Luckily for both of them, he did his work ahead of time and knew that Key West, Florida was going to be the perfect location. It offered multiple choices for every aspect, from how to get there and where to stay to where to hold it and what kind of food to serve at the wedding reception. Best of all was the number of full-time professional wedding planners living and working on the island. He and his fiancé had a chance to meet with several of them to choose the one that they felt most comfortable working with and thought could help make their dreams – okay, his dream – come true. Already, the wedding planner has proven her worth by setting up tasting meals at several of the finest Key West restaurants to help them choose the reception menu. She checks in by phone and email constantly to keep them up to date and responds promptly whenever they have a question or concern. I’m just worried my son is setting a dangerous precedent of efficiency for the rest of his marriage.